In one year, EA Sports has done more to right the wrongs of Maddens gameplay past than in any time in the illustrious series' history. 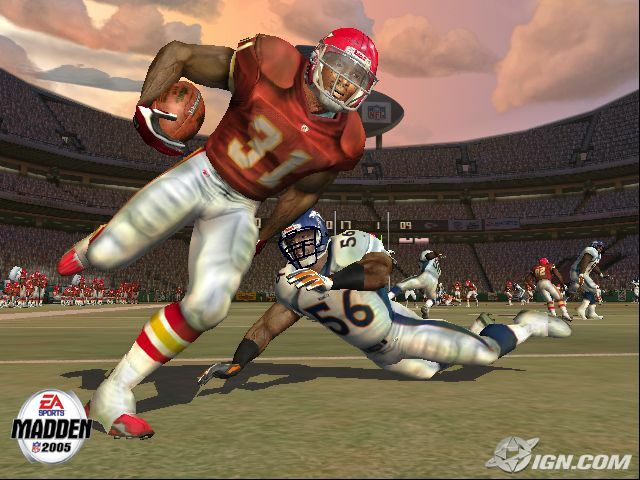 Play Madden NFL 2005 once, and you might notice the big hits and how aware all of the defenders are on the gridiron. Play it five times and you'll realize how defensive hot routes completely even out the field and that for the first time, maybe in any football game, it's not just fun, it's actually meaningful to D-up. Play the game 20 times and you really start to appreciate the brilliance behind the All-Madden engine. 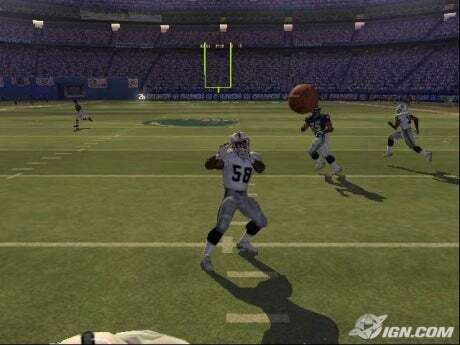 Madden NFL 2005's AI is by far the slickest, smartest AI of any football game ever put to polygons, period, and the main reason why Madden is once again the single most dominant force in sports videogames. The game might lack the presentation, the visual eye candy of ESPN NFL 2K5, but more than makes up for it in the one area that counts the most, the reason you buy a game…gameplay. If you played last year's offensive showcase, the game built around Michael Vick and explosive offenses that only slowed down to fake a handoff, then get ready to completely re-learn how to play Madden. Sure, keep it on Pro level and you can still run up the score and throw off of your back foot 40 yards to a streaking receiver. But play on All-Madden and try these same tricks and you'll be slapped with a reality that stings harder than a Ray Lewis spear. The developers at Tiburon have successfully implemented elements that ruin past football games for the simple fact that once you play with the Hit Stick, once you play with defensive hot routes, once you play with offensive formation shifts, then you try to go back to playing 2004 or even ESPN for that matter, you're left lost, missing the level of depth and ingenuity included in Madden this season. The feature that seems to get the most attention, and is sure to fill the mind with some of the most devastating highlights ever seen in an NFL simulation, is the Hit Stick. When you first learn to use it, or even when you first start playing 2005, you'll probably miss-time the maneuver and watch as your defender stumbles past the ball carrier and gives up a big gain. You might curse the Hit Stick, even give up on using it, but that would be a huge mistake. The more you try it, the more you learn that, like everything, it's all about the timing, and in order to time the flick of the right analog stick correctly, you'll need to hit the Hit Stick a little earlier than originally imagined. Once you get the move down, however, it becomes one of the most lethal maneuvers in the game. Hit Stick tackles force more fumbles when timed right, smacking the runner down with a thud while the ellipse (or "oval of revolution" depending on your math knowledge) shaped ball bounces around the turf for your defense to pounce on. The Hit Stick also unleashes some of the most brutal tackle animations of any football game around. Players get launched into the air, take forearm smashes, and land with such force, gamers will grimace for weeks at the wreck of bodies left in its wake. Utilizing the Hit Stick is definitely a risk/reward proposition, though, because just when you think you have the timing down, the player with the ball will put on a juke that makes you look and feel so stupid as you slide head first down to the ground that you'll wish you would hold off the highlights every once in a while and do like coach said and wrap the player up. To increase the risk, when you try to Hit Stick a rumbler like Mike Alstott with a corner like Ricky Manning Jr., the tiny corner will bounce off the runner which may lead to a substantial gain for the offense.